​solved their challenges in 2017-18. This team created a 750-gram structure out of wood and glue that held 720 lbs and created a story that played on a character’s “weight of guilt” that was symbolized by the weights the structure held. They set their story in a modern-day castle and made a Rube Goldberg machine, which created food for the dragon who taught the young knight to be brave, loyal and honest. This team's solution featured two cultures: the Irish culture and an imaginary culture which was very science-oriented and which only saw things-- literally--in black and white. On St. Patrick's Day, some Irish children practice an Irish song on piano and Irish flute, and then run off to find a rainbow they see in the distance. That same day, Science Day, some black-and-white children recite some science facts and then run off to investigate an "arc" they see in the sky. The children meet and misunderstandings occur. But then a father-daughter scientist pair (also the narrators) bring their new inventions-- shots that allow the two cultures to see in black and white and in color, respectively. The children decide to combine their holidays into a new holiday-- St. Science Day-- and host a parade in its honor. They don fun hats, and parade to the previously practiced Irish tune. For their service project, this team of 5th graders conducted two drives at school to benefit the Humane Society. They raised money to buy pet food and collected empty paper towel and toilet-paper rolls for the small animals to chew on. For their skit, they created a cache storage device that looked like a dog house and then opened up to reveal the set for their performance. Their skit showed their journey and included a puppet show. They provided two infographics that showed quantitative data for their drives and included the needs of the community. The girls made one graphic that looked like dog collars and the other was in the shape of a paw. The girls took 9th Place at state and felt proud of their work. This team's challenge was to create a structure that could have weight dropped on it, while also performing a skit with a sudden event. The team split up who was working on each part of the challenge. Half worked on the structure and half on the skit. They had a lot of fun and with a lot of trial and error kept trying new things and taking notes. The skit is about a science fair, a crazy lady who is telling fake news, and a volcano that doesn't actually explode. By the end, the team had a pretty good skit and a great structure, earning them first place at Regionals. They changed a couple of things and made their structure even stronger. When they got second at State, they were thrilled! The scientific challenge required teams to create an amusement park attraction in an unlikely location. The Tosa East team solved the challenge with a roller coaster that serves as a metaphor for fate, which controls the life of their main character, Anne. Their unlikely location: a scrapbook representing the life of Anne. They designed, created, and painted a 6’x6’ pop-up scrapbook to visually represent the location. The scrapbook and the roller coaster both show the milestones throughout Anne’s life: learning to walk, getting a dog, meeting a friend, breaking an arm, getting married, getting a job, having children, getting divorced, losing a grandma, losing a job and having a granddaughter. 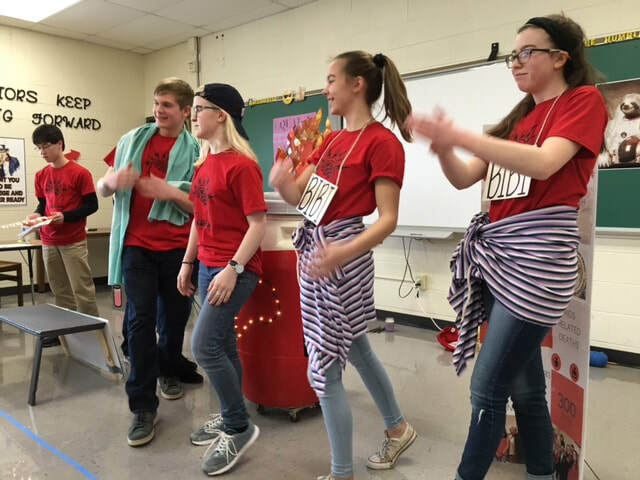 To help dramatize these events, the team used auditory effects--including a dog's bark, the sound of a bone crunching, and various songs such as the "Wedding March" and "Pomp and Circumstance," played on simple instruments to symbolize the simplicity of a scrapbook. One of their team choice elements is a camera, which Anne’s grandma uses to take pictures for the scrapbook. The camera is made from the motor of a remote-controlled car, which is used to release a pre-printed photo, and a cell phone, which flashes like a camera when it's texted on the LED flash-accessibility setting. The second team choice element is symbolism, with colors that help to clarify characters as the actresses playing them change over the course of the presentation. This team of 4th and 5th graders spent much time debating what organization they wanted to help. Some felt very strongly about helping animals, and others felt just as strongly that they wanted to do something for people. In the end, Pets for Vets was a perfect fit and allowed all of the team members to feel like they were contributing. The team designed and created several different homemade pet toys and dog treats which they sold at Roosevelt's Holiday Festival. In total they raised $214! After they completed their project, the kids needed to put together a presentation that included a cache storage device that everything they used had to fit inside of. The kids worked hard putting together a set, writing a script and even including infographics about the program in order to get the word out to people who may not have heard of Pets for Vets before. The team ranked 4th, which they can be very proud of. They are already looking forward to Destination Imagination again next year! This team decided to research the cultures of modern Iceland, the Vikings, England, Germany, Ireland, and Ancient Egypt. They discovered that in Iceland people eat rotting fermented shark meat, cats were considered sacred in Egypt, and the Vikings were into board games. Initially, all of their skits involved a theft and efforts to apprehend the villains, until they realized that there were actually no points associated with catching bad guys. Once they got down to the business of quests, setbacks, unusual locations, the bed-sheet prop, and demonstrating the personal traits of explorers, they were on fire. Their regional skit involved searching for Beethoven's sheet music in a bear's den, despite the fact that famous Egyptologist Howard Carter could not stop laughing at his own joke. This team built a lightweight structure out of cork, wood, fishing line, and rubber bands capable of withstanding and holding dropped weight. They incorporated the structure into a skit about scientists who needed to calculate how much weight to "drop" from a space station to put it back into its regular orbit. The space station was represented by hand-drawn animations projected on to a team-constructed screen, while the scientists got news of the Space Station through the OK-O-Meter, that put them on high alert with a blinking red stoplight and other lighting changes. The used stoplight was purchased without wires, so the team needed to re-wire it, and put together an electrical control panel to turn their equipment on and off. The team created an additional character, the astronaut, who was voiced through a Snap Chat filter to add extra personality to the skit. This team designed and carried out a service project to benefit Grandmothers Beyond Borders, a Milwaukee-based organization that assists women in rural Uganda who are raising their grandchildren after losing their own children to HIV-AIDS. By selling homemade candles at East and holding a fundraising dinner, the team raised more than $2,300, which will purchase solar lights for these grandmothers who live in an area with no electricity. The team then created an original skit about their service project, complete with infographics and a "cache storage device" for holding their costumes and props. The highlight of the season was forging connections with the board members of Grandmothers Beyond Borders, and knowing that the team has touched the lives of people halfway around the world.